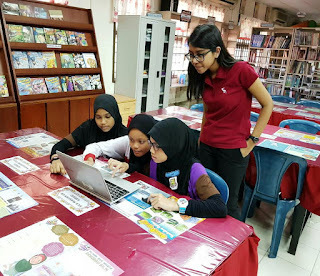 Sometime earlier this year, I got looped in an email from the Director of WWCode KL who was looking for volunteers on behalf of UNESCO's Hour of Code program director. The program wast to be held in conjunction with Women's Day. 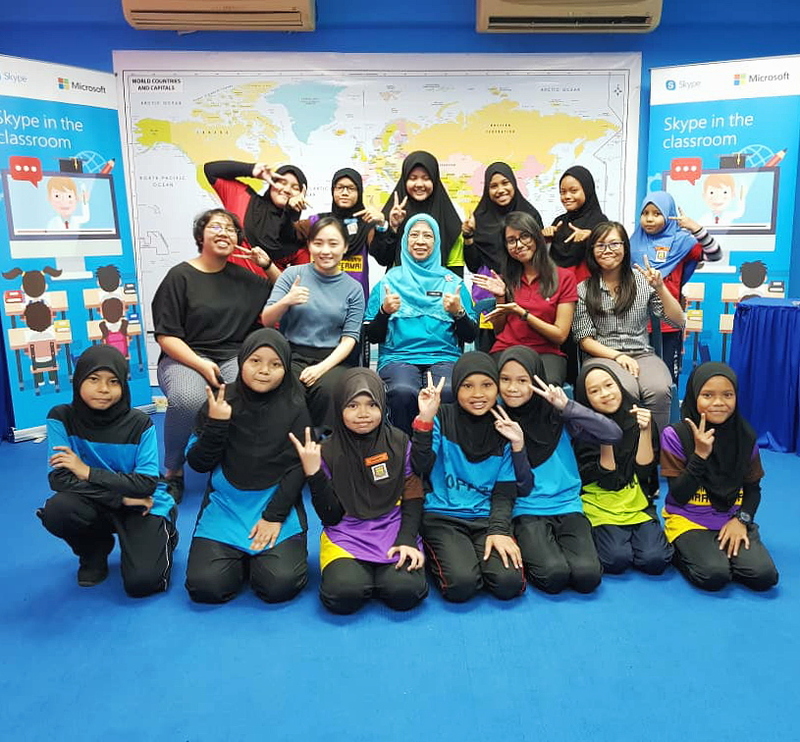 The aim was to have several women volunteers attend to primary school girls to guide them in a game of code blocks where they can learn basic concepts of programming. I enlisted as volunteer and after that, there were several Skype meetings with UNESCO's science program director, Ai, a school teacher, Mdm. Fadzillah and three other volunteers. We decided to conduct the program in the afternoon of 27th of February at SK Tiara Permai. On the day of the program, I traveled to Sentul to visit Tiara permai primary school. I was on my study break and since I had only two final papers to sit for, I figured I had plenty of time to spare 😋(it was an excuse for me to escape from my boredom). I reached Sentul an hour early and so I decided to grab some light snacks for lunch. I wasted a bit more time on my phone before riding on a taxi to the school. I reached the school during the time the morning session of the school was over. The cars driving in, carefree students running about and the sweltering heat was all very overwhelming. It all seemed to familiar too. 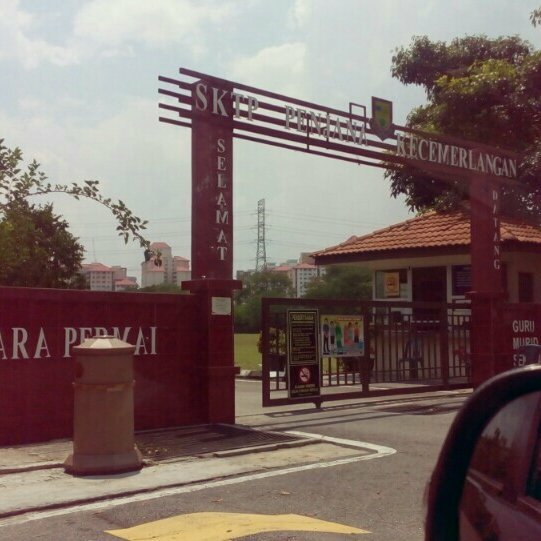 For a brief second, I found myself reminiscing on memories of my own primary school years. The school guard then directed me to the library where the teacher, Mdm. Fadzillah was at. There was already another volunteer, Kwan Lee, at the library with Mdm. Fadzillah. I greeted the two of them and introduced myself. I took a seat next to Kwan Lee and chatted with her while waiting for two other volunteers to arrive. 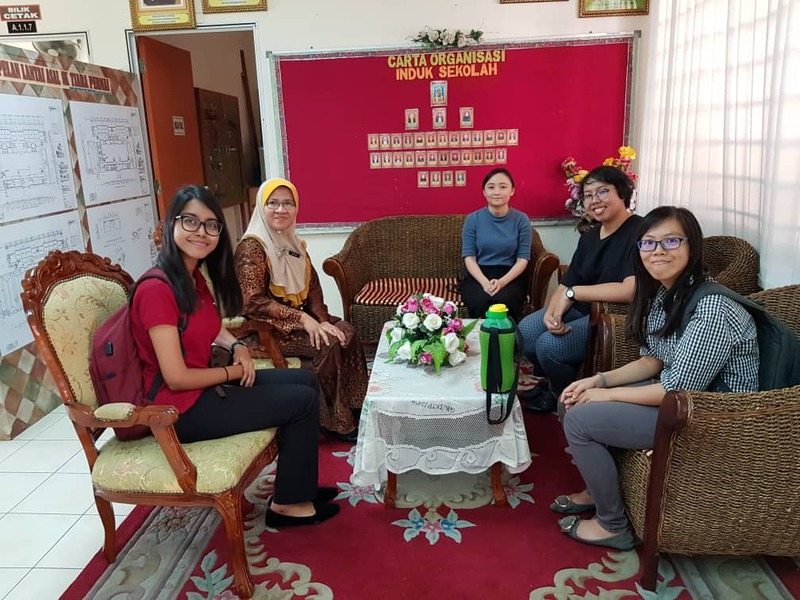 From left: The headmistress, Sarah, Adila and Kwan Lee. 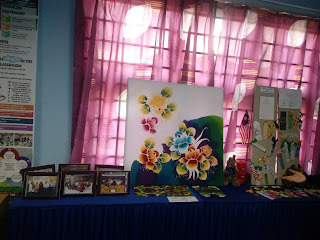 After meeting and chatting a bit with the headmistress, Mdm. Fadzillah took us back to the library. her students were already inside, all seemingly excited to try out Hour of Code's Dance Party code game. Mdm. Fadzillah handed chromebooks to the girls while Adila explained some introductory slides to the girls. All of us volunteers realized just how broken our Bahasa Malaysia had got since we left school. We struggled a little bit to communicate with the girls in Bahasa Malaysia but there was no any real language barrier. The girls were able to understand our instructions and answer our questions just fine😁. Let the coding-jamming session begin! It was really interesting to observe the girls learning about events and objects in coding through the game. One girl exclaimed "Ahh I see now why we were getting two of the same dancers, the Moose dancer was named dancer1, it's the same name given for the Cat dancer! The names of the dancers play a role!". The girl cleverly resolved to giving unique names(variables) for each dancer (object). An hour passed by quickly and Mdm. 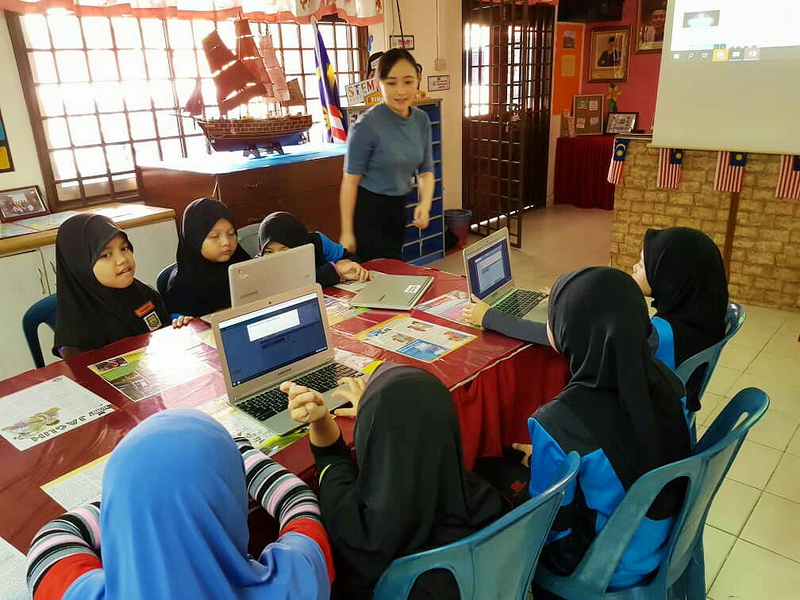 Fadzillah wrapped up the session and asked the girls to submit their project links once they were satisfied with their work. 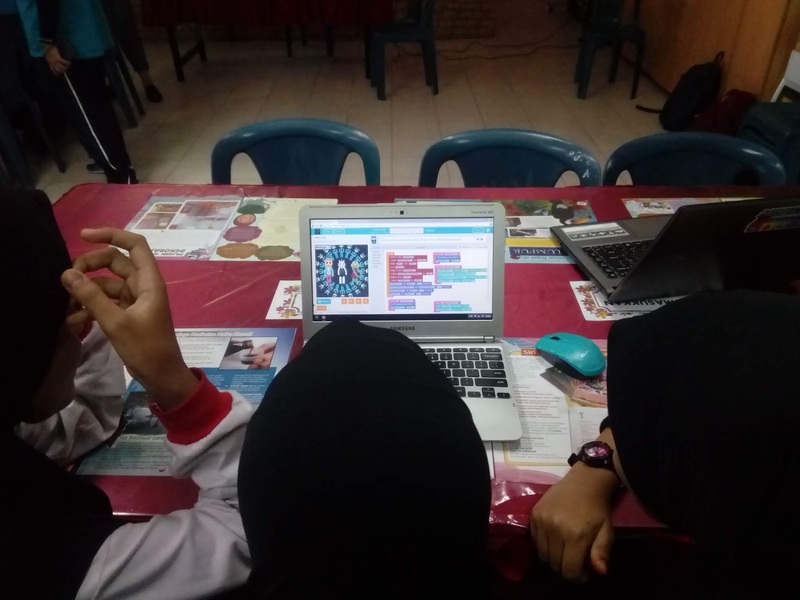 In the meantime, Adila took the opportunity to ask the girls if there was anyone among them who would be interested to study IT/computer science. It was good to see a few of the girls raise their hands excitedly. I felt like I needed to let the girls know that coding is not always drag-and-drop code blocks, and so I told them that in reality, there are lines of typed codes. The girls salam our hands before we left for a group photography session at the Skype room. After that, the girls bid us goodbye and headed back to the library to resume their Dance Party projects. Meanwhile, Mdm. 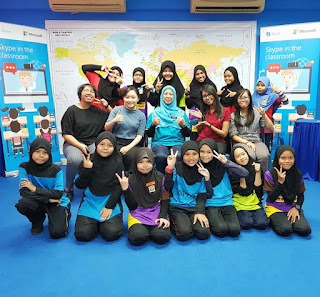 Fadzillah showed us around the Skype room and explained to us that she and her students often engage in Skype video call sessions with school children from around the globe. The schools would exchange knowledge about their country's language, culture and even scientific researches. 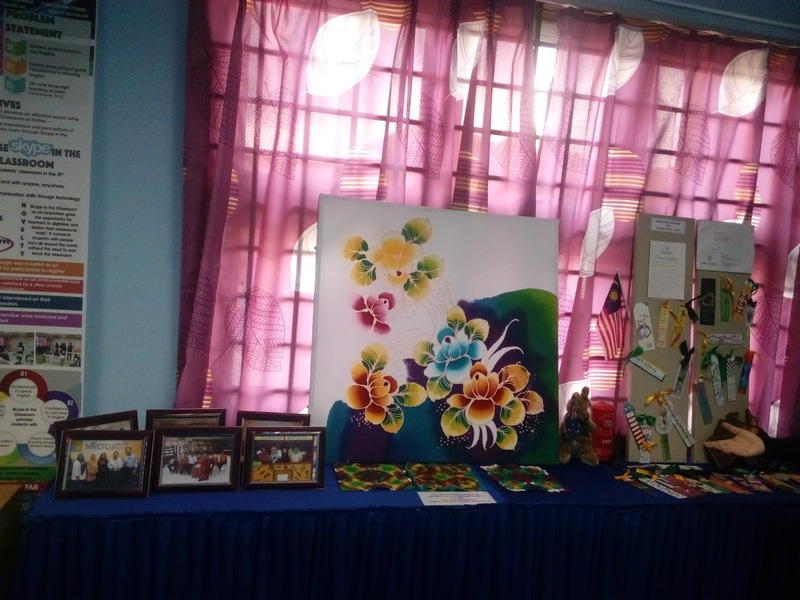 Photographs, batik, bookmarks that were exchanged with schools around the world, among many other souvenirs displayed in the Skype room. Mdm. 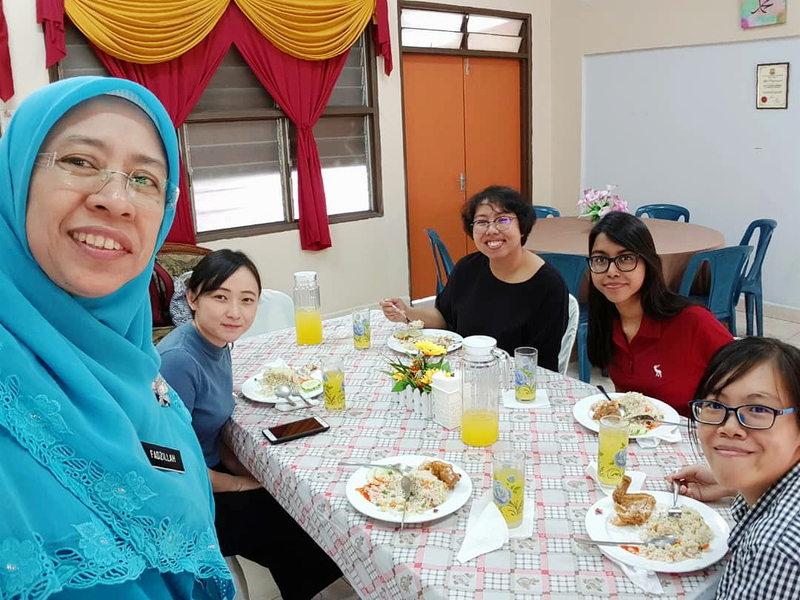 Fadzillah then invited us to join her for lunch at the teacher's cafeteria but she had yet another thing to show us outside the Skype room! Mdm. 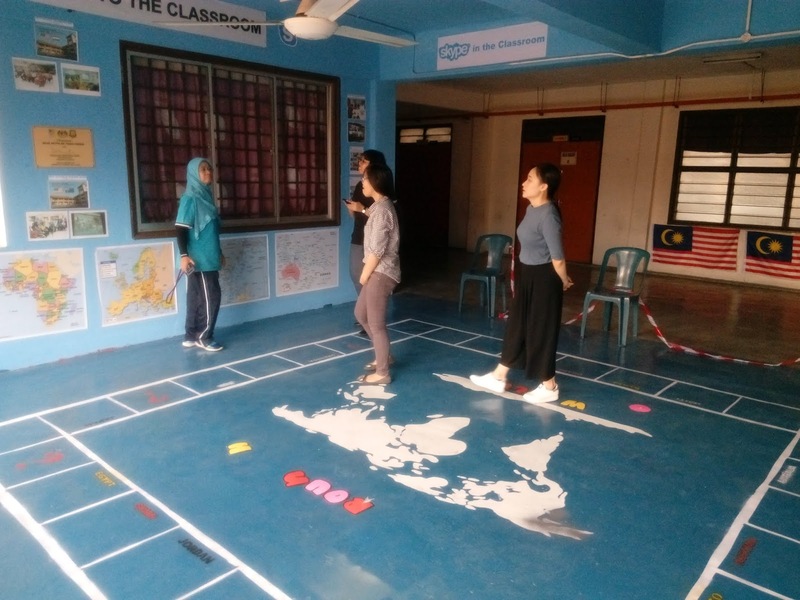 Fadzillah proudly showed us a large map drawn on the floor just beside the Skype room. It was drawn in a Monopoly board game style. Mdm. 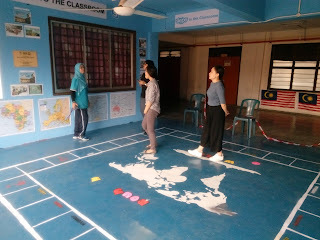 Fadzillah demonstrated to us that students would have to throw a gigantic dice and move some steps and if they land on a country name, they would pick up a flash card bearing that country name and they will get to progress if they can answer a small trivia about the country. I thought that was a brilliant idea to expose primary school students to geography as they don't have that subject in their syllabus just yet. Finally we go downstairs to have late lunch! I had a hearty meal after a long albeit enjoyable day❤️. We chatted a bit and finally called it a day when someone brought up the topic about traffic😂. Sarah volunteered to drop me off at the nearest LRT station. Volunteering to teach[informally] at a school was a whole new experience to me. There was so much to take back at the end of the day. 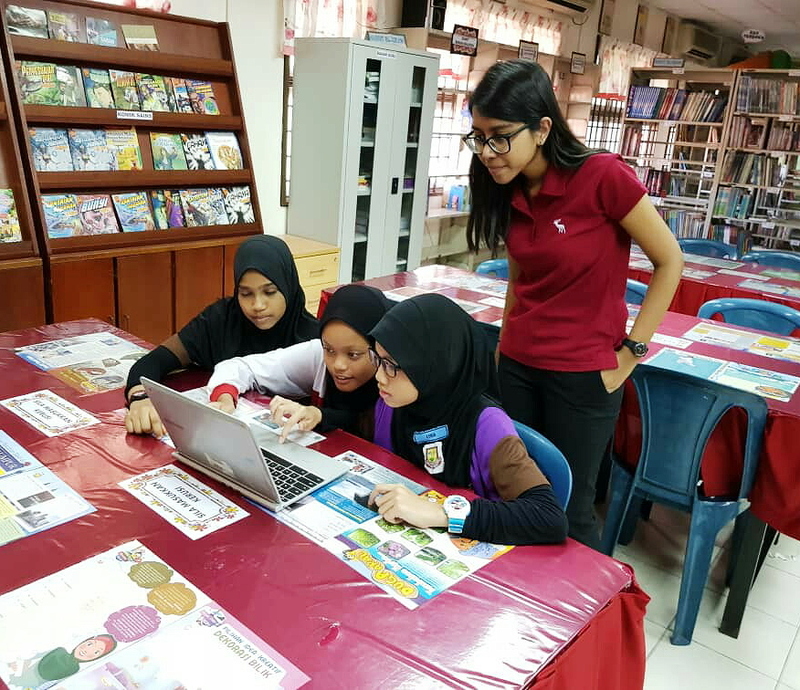 I loved bonding with the little girls and sharing with them what I was passionate about - coding. Also, women teaching girls to code seemed like a very empowering theme to pursue. I hope to have more opportunities like this to come in the future 😊. Ears plugged and shoelaces tight, I set off for the tracks on the field nearby. The wave of music from my phone is slowly seeping into my mind and my being as I approach the field. 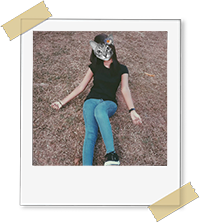 I look up to the heavens and I see the stars shining in their bright luster against the backdrop of the night sky. My eyes are quick to spot Orion's Belt and an isolated diamond emanating a faint glow. 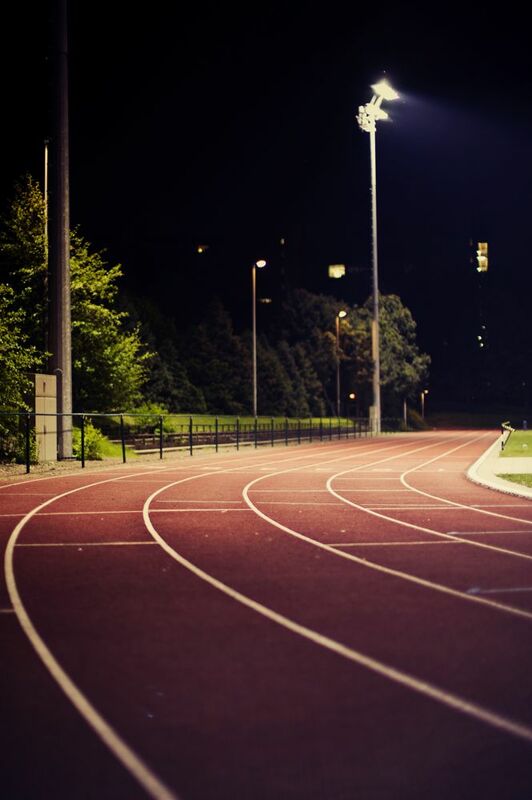 The tempo of the music in my ears is slowly building up and I start to feel a rush of adrenaline. 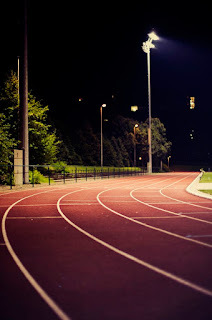 I take longer leaps forward and soon enough I am walking at a faster pace, jogging at intervals to my heart's content. My mind is clear of the mundane worries of the day and is drowned in a sea of infinite calmness brought about by the good music in my ears, the gentle zephyr that ruffles my hair and the thumping of my own beating heart. I look around the vast field in awe, in realization that I am here all by myself, at this time, at this moment, I own this field. At the culmination of this thought, I dance and I twirl around in unconstrained freedom and without a care in the world. I find myself marveling at the fresh air, the magnificent night sky, the night lights even, and life itself, all of which I so often take for granted journeying through life in the fast lane. For a while, I am drowned in my own thoughts. Drops of sweat start to trickle down my face and my breathing gets heavier. I have built enough motivation and momentum now to keep going. I feel a sense of accomplishment as I go beyond limits that my mind have concoct before this rewarding undertaking. I keep track of the laps I have completed . "One more", I urge myself. I take note of the time on my watch. Nearly an hour has passed by. I finally call it a day and decide to go home. I make a promise to return to the fields another day, another night soon. Before long, I return to my mundane work but now with a renewed spirit and zeal. Evil by definition means an act or thought that is deemed wicked and immoral. For many inhabitants of the Earth, they believe that there is God and Satan. That there is Heaven and Hell. That there are Angels and Demons. That there is Good and Evil. But as our human thinking have evolved and continue to evolve, we have begin to realize that it is not always black and white. That gender is not always binary, that a religion is itself a spectrum of beliefs and interpretations on its own, and so is everything else for that matter. Good and Evil too have many grey, overlapping, neutral areas. Hi, I'm Evan and I maintain this blog with my occasional musings. Reading, drawing, coding and volunteering are some of the things I love doing. Copyright © evangelista-grace.blogspot.my. Theme inspired by Libretto Theme.